Maryanne, our amazing and incredibly efficient Parish Administrator, coordinates all parish communications and records, working with staff, ministry leaders, and the Rector. Starting at Good Shepherd in 2009, she has overseen and encouraged the transition from paper to electronic communications. This includes coordinating a myriad of schedules and putting together a monthly Master schedule, the Shepherd’s Crook newsletter, the annual report, and other internal communications, many sent by email. At the same time she graciously continues paper mailings to parishioners as needed. Maryanne runs the “Parish Print Shop” creating covers, content, and inserts for weekly Service Leaflets under the guidance of the Rector. She handles all of this with the most wonderful calm and competence! 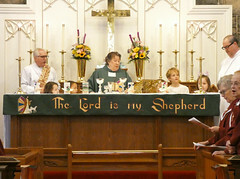 Meg began leading the Music Ministry at Good Shepherd in September 2011. To everyone’s delight, Meg has reintroduced the Adult and Children’s Bell Choirs to supplement the Adult and Children’s Vocal Choirs. Meg directs all four choirs with gentle grace and elegance, selecting the music and leading weekly rehearsals with strong musicianship and professionalism. Meg also coordinates beautiful praise music for special events such as the Lenten Cantata and the Christmas Pageant. Good Shepherd is blessed to have Meg leading us in our musical celebration of God’s gifts. Quoting Rodgers and Hammerstein, “How do you find the word that means Maria?” Energetic, fun, funny, kind, dedicated, loyal, faithful! With her tremendous generosity of spirit, Maria is always looking to help out everywhere. She does it all, making everything sparkle, including our spirits. Maria is a person you want to meet, for your life will be enriched! We have a robust team of volunteer staff at Good Shepherd. This team handles all sorts of important jobs including Christian Education for children and adults, all of our youth programs, website and social media, rectory and property repairs and improvements, gardening and landscaping, and major cleaning on various workdays through the year. The eleven voting members of the Vestry are elected by vote of the congregation at our Annual Meeting each January. In addition to the Senior Warden and Junior Warden, there are nine general Vestry members. 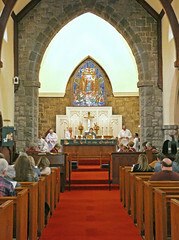 The Vestry term is three years in rotation, with three new members elected each year. The Vestry elects the clerk and the treasurers, which are non-voting positions. The Vestry meets monthly with the Rector to administer the business of the church with a range of duties that include stewardship and budget development, oversight of daily church operations, property decisions and maintenance, and appointment of special committees. 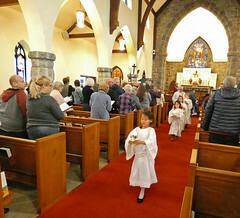 Vestry members serve on various Vestry committees and as Vestry liaisons to coordinate with ministry leadership for all activities and ministries at Good Shepherd. In addition to the Vestry, there are lay ministry leaders for each of our ministries at Good Shepherd. We are a parish of faithful and joyful do-ers. This is part of our commitment, our fellowship, our stewardship, our spiritual journey. This is who we are at Good Shepherd!